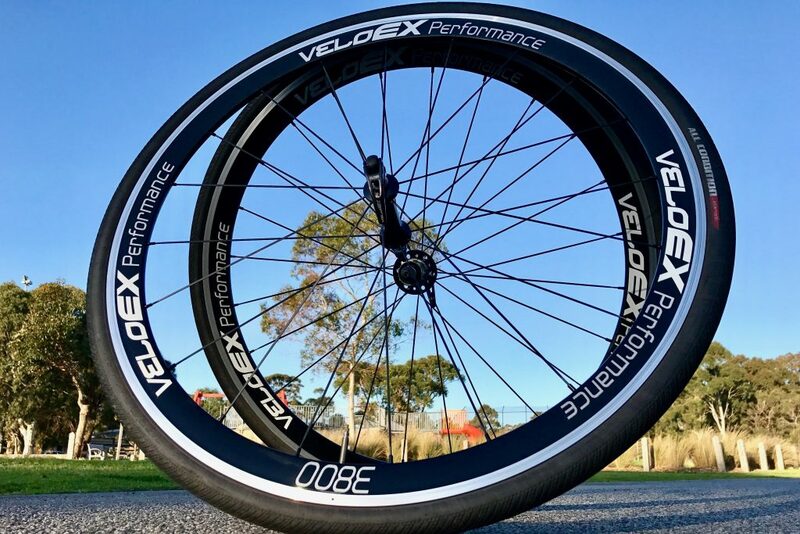 I recent road tested the Veloex 38 mm clincher road wheels during my day to day rides here in Melbourne. In this review I will outline my experiences with this wheelset, riding solo and in local bunch rides across flat and hilly terrain. I will also reopen an old debate of carbon vs. alloy clinchers to whet the appetite before going deep into the Veloex wheels. But firstly, let me ask you a question. What’s more important for you – reliability and confidence or weight and aerodynamics? I am conscious aerodynamics and weight do go hand in hand, but they’re also looked upon separately when you consider how many cyclists measure the worthiness of any particular bike on their own unique scale of importance factors. For example, when you scoot past a local cafe post your morning ride, you may see a lycra brigade pinpointing certain features of a parked bike which has distracted their latte-sipping. I’m not sure if you’ve noticed, but many enjoy pinpointing the lifting prowess of a road machine. That was me many years ago, until I became a little more educated about what was truly important for my own personal riding. Wheelsets and their capabilities should be held in high regard irrespective of the way you ride a bike. The Veloex 38 mm alloy clincher wheels settled in nicely on my S-Works Tarmac. It was 2011. I’d been riding for a couple of years but the tantalising componentries and accessories that come with cycling hadn’t truly put a dent in my wallet yet. At that point in time, by chance, I’d just managed to score a job with a US software company selling a hot product. The commission cheques started rolling in and my bank balance rose higher than ever before. Through some sneaky tactics I also started discovering that my wife was a little naïve to potential changes in wheelsets (as opposed to a full bike). Score. To summarise: I essentially stumbled across a beautifully blended sequence of events that enabled me to become a road wheel fiend for a solid year. I would be unpacking a new set one day and the next day I was back online searching for the next set. “I’ve just purchased a 60 mm carbon clincher, but what if it’s a windy race day (in my C grade criterium) – I’ll need a 30 mm pair also”, I could hear my justifying thoughts echo. “And then there’s the fast and slow training wheels I need” (for a total of 150 km of training I’d be doing every week). It’s funny for me now when I reflect on how ridiculous my justifications were at that point in time and how badly addicted I was. While I did have lots of fun during this wheel bonanza, riding new wheels and constantly changing the dynamics of my bike did leave me with a forgone conclusion. Carbon wheels are for racing and alloy clinchers are most ideal for day to day riding. A lot has been written about carbon clincher wheels in addition to comparisons made between generic Chinese and branded carbon wheel manufacturers. If your buying habits are anything like mine used to be in 2011, you’ll often find yourself staring at an awfully cheap set of deep carbon clinchers sold by some Chinese distributor on eBay. I never took the plunge, but I know many that have. While it’s not entirely fair to compare these wheelsets to the mainstream brands, pinpointing their weaknesses does highlight some concerns cyclists should have about the carbon clincher more generally. There’s a property of resin called the “TG”, which is the glass transition temperature which occurs when the resin starts going soft. When you’re braking downhill you can see temperatures of 250 degrees Celsius plus. A lot of the resins used by lower-end wheels manufacturers are poor quality where the resin starts to transition at around 180 degrees Celsius, making the resin go soft. When the resin starts going soft it can’t support the load and heats up. Creating heat against an inner tube is ultimately when accidents occur, with front tubes exploding or even tyres coming off the bike. As the most effective braking on a road bike is the front brake these accidents often occur with the front wheel, exacerbating a fall and adding further woes to the carbon clincher. Major brands such as Zipp, use “defence category” resins to ensure potential tyre blowouts are much less likely to occur. Raoul Luescher did a comprehensive review piece with the Cycling Maven which you can watch here. Although the interesting sentiment for me is that higher quality resins will also soften at 180 degrees Celsius, from what I understand they break down more slowly, minimising the heat combustion that you would get with a lower quality resin. Outside of the resin there are many additional attributes that add or take away from the quality of a carbon clincher – especially the carbon fibre itself- but as Raoul puts it, when buying a cheap carbon clincher “you’re entering a lottery”. Yes carbon clinchers are lighter and potentially more aerodynamic – given weight and flexibility within the mould – when tested in a wind tunnel. But what if I told you the aerodynamic gains were marginal and the weigh factor predominately applies to acceleration? 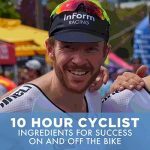 That’s great if you’re constantly out of the saddle sprinting, but how many of us are doing that on a day to day basis? And could the carbon fibre really be the difference between beating your mate up a hill or not? You can’t deny an alloy rim for braking power vs a carbon rim. 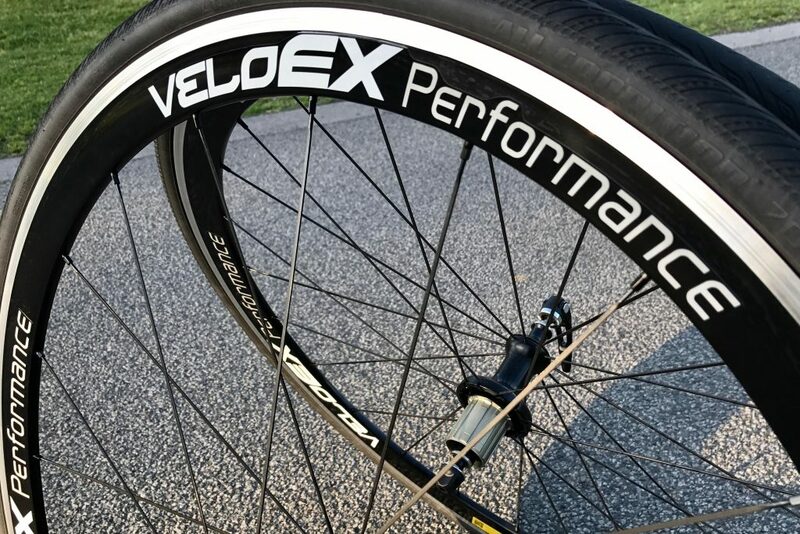 The Veloex Taiwanese rims are well rounded for confident braking power. While carbon can be more aesthetically pleasing to the eye on close inspection, many of the alloy rims that are being manufactured these days have a fine-tooth quality that almost makes it difficult to gauge the difference. Then taking looks aside, alloys are much more practical wheels. Confidence is king with the alloy wheel. I recall a set of carbon clincher Mavics I once owned. I lost count on the amount of times I ended up back at my local shop, tuning the wheel following another buckle. I recall coming off my bike at an intersection after hitting the brakes hard on a set of carbon Rovals. I’m certain I would have stayed on the bike with a solid set of alloy rims. I recall a set of Fast Forwards I found with a crack in the carbon rim only 6 months after purchase. Yes they replaced the wheel, but it was a painful process I’d prefer to avoid. I don’t recall any moments like this on an alloy clincher, hence why the wise old owl that sits on my shoulder has me sporting alloy clinchers day-to-day. I’ve now got my go-to’s, which give me the confidence every time I ride out the front door. For me, wheel “confidence” encapsulates speed, braking performance, robustness, and durability. Hand-built (in Taiwan) 20/24 Alloy 700C Road Wheelset with 38 mm High Gloss Alloy Black Rims. Ezo Japanese sealed bearings, which were given a “high quality” wheel bearing thumbs up on this comprehensive technical review. Rim Tape, Brake Pads and Skewers. padded wheel bags and a 12 month warranty. 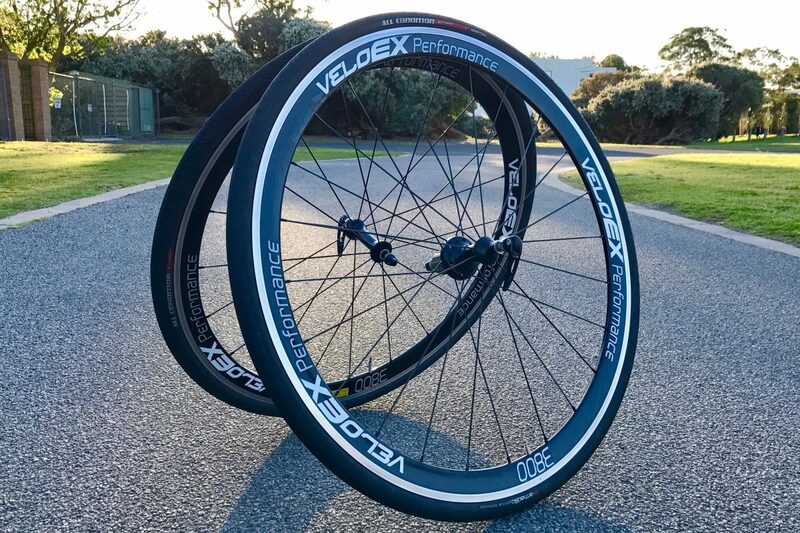 The Veloex wheels ticked all the boxes for me at a very reasonable price. I swapped out a set of Fulrum 5’s for the Veloex alloy clinchers. Given they’re at a similar price point, especially given the current offer from Bike Gear Now, I feel the comparison is warranted. Immediately I felt the aero rims take effect. Not so much in terms of speed – as I was rolling solo at 33 km per hour – but their presence on the bike, swooshing through the air with that formidable aero sound. At speed, i.e. 40 km per hour and above, the aero build of these wheels really made their presence felt. I was riding in a popular morning bunch ride here in Melbourne called the North Road Ride. While this bunch ride is predominately flat there are a few “false flat” sections where the road will slightly incline and decline. On these parts of the ride I could really feel the personality of the Veloex wheels shine through. On the slight road decent I would find myself up close and personal with the wheel I was following. The Japanese Ezo bearings felt as if nothing would hold them back, and I was enjoying catching my breath given my fitness level has been on the decline in recent times. On the other hand, rolling up the false flat accents was a slightly different story. Keeping in mind these wheels aren’t on the light side (when comparing to carbon clincher counterparts), at a touch over 1700 grams, I could feel the weight of the wheel ever so slightly holding the bearings back from my favourite cycling illusion – riding fast without having to pedal. While I didn’t notice this so much while climbing some steep ascents with the Veloex wheels (during our solo time together), it’s an important factor to consider if your goals are to have an aero wheel and also climb like a mountain goat. Unless your sub 70 kilos and racing out in the country somewhere, I doubt this consideration needs too much thought. I really felt the confidence and reliability of these wheels shine when I was in the drops hitting 60 km downhill. The alloy rims and 20/24 spoke count are robust and showed very little flex. In fact, I really had to hammer around a corner to feel any give within these wheels. While the 38 mm depth provides the whoosh and feel of an aero wheel, the side winds provided little disturbance to my fast downhill decent. 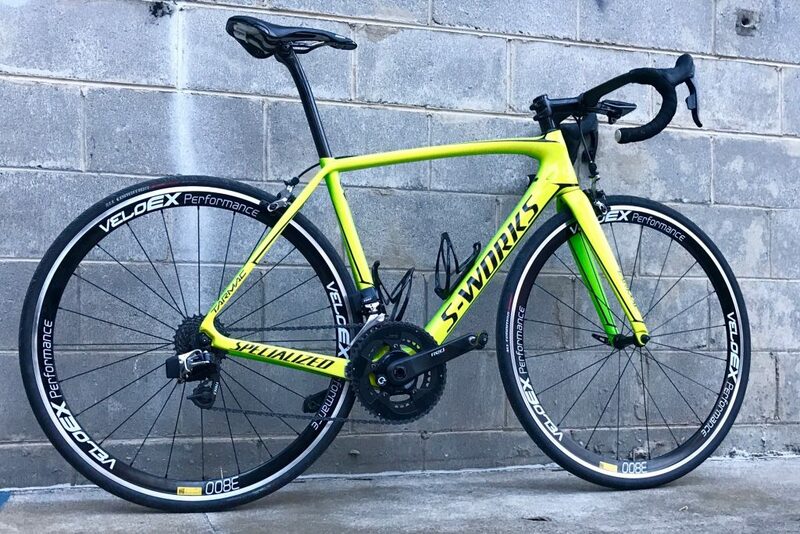 Lastly, the wheels provided a nice “pop” to the aesthetics of my S-Works Tarmac. While some have different tastes and prefer a more subtle look, I have an inclination for the sticker. It provides a bit of bling to the bike and makes a few heads turn at a very reasonable price. 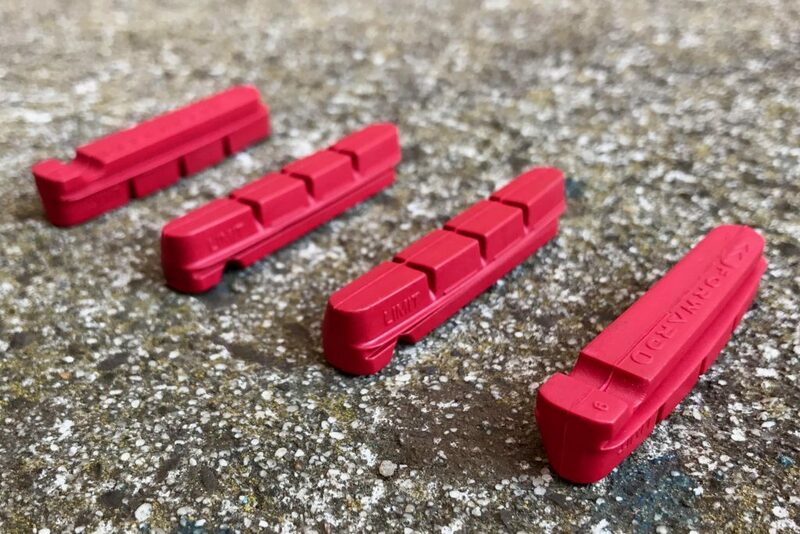 The Veloex wheels come with some nice additions, including these red brake pads. A ‘soft’ design for greater braking confidence. Given the price and the carbon alloy compound, I give these wheels a big tick of approval. Carbon clinchers are no good. I’ve come off due to a blow out. Alloys all the way.